For centuries, bitumen has been used in a wide variety of applications, mainly in the production of asphalt. Even though there still are natural bitumen deposits, in Trinidad for example, Europe processes bitumen manufactured industrially in refineries. The various types of bitumen, such as straight-run bitumen, polymer modified bitumen, high vacuum and hard bitumen as well as oxidized bitumen, can be processed and modified as the intended applications require. This market study by Ceresana offers a complete overview over the European market for bitumen. Besides information on demand, the study also contains data on revenues, production, trade, market size, market growth and market trends. For the purpose of this study, Russia and Turkey are counted as European countries. Bitumen plays an important role in the European construction industry: Analysts at Ceresana expect total revenues to rise to about €12 billion until 2021. Demand for bitumen fell in previous years, mainly because the economic crisis caused construction projects to be postponed. By now, the economic recovery is resulting in a renewed increase of demand. Since more than 80% of the bitumen consumed are processed into asphalt, national as well as transnational traffic infrastructure projects are exercising a decisive influence on total demand for bitumen. Optimizing traffic infrastructure is paramount for the economic development of individual countries and the competitiveness of Europe as a whole. Also, a continuous increase of traffic volume in individual countries necessitates both a comprehensive expansion of road networks as well as expansive modernization and refurbishment measures, in metropolitan areas in particular. It is especially Eastern European countries that still need to improve the quality of their roads, while the majority of Western countries already have an extensive and high-quality road network. Demand for bitumen also depends on the development of the sector building construction (new buildings as well as refurbishments and renovations). Waterproof bitumen roofing membranes are often used for flat roofs and feature easy processing and low weight as well as high economic efficiency and durability. Yet bitumen is suitable for a wide range of applications, the sector building construction for example uses it in the preservation of structures or the production of screed. Considerable regional differences in construction investment have presented themselves in previous years: Especially in southern European countries hit hard by the economic crisis in 2008/09 the construction sectors suffered dramatic losses. Construction industries in countries like Turkey or Russia, on the other hand, experienced a much more positive development. In many countries, the number of new residential and commercial buildings constructed fell notably as a result of the economic crisis. Positive impulses for consumption of bitumen, however, will stem from environmental protection targets in individual countries and their transposition into national law. Demand for bitumen is largely influenced by the economic situation of a country. In many cases, investment in road construction was and is postponed in order to help consolidate national budgets. Economic factors like unemployment rate, available income and demographic development are also playing an important role in consumption of bitumen. Increasing private consumption results in an increased interest in commodities and therefore suitable transportation networks in order to safeguard the exchange of goods between countries. An increase of income leads to a rise of investment in residential construction as well as in modernization and refurbishment measures. Chapter 1 provides a presentation and analysis of the European market for bitumen, including forecasts up to 2021: In addition to revenues, demand for and production in each country as well as influencing factors are explained in detail. Detailed data is offered for 27 countries. Information is given on demand for, revenues generated and trade with as well as production of bitumen. Demand for bitumen is further analyzed in detail split by the applications road construction, roofing membranes as well as other applications, for example corrosion protection for pipes, protective coatings for steel, iron and other metals or the paper, cable and tire industries. 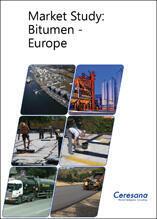 Chapter 2 offers an overview over the entire European market for bitumen, split by products. Additionally, consumption in each application will be analyzed split by countries. Chapter 3 provides profiles of the largest manufacturers of bitumen, clearly arranged according to contact details, turnover, profit, product range, production sites, profile summary, and specific information about bitumen products offered. Extensive profiles of 41 most important manufacturers are provided, including BP plc, PCK Raffinerie GmbH, Royal Dutch Shell, Repsol S.A., Rosneft OJSC and PKN Orlen S.A.